IHS iSuppli released a report on Tuesday that suggests the iPhone 5 costs Apple between $207 and $238 to build, depending on the model and including both the materials and the price of manufacturing. 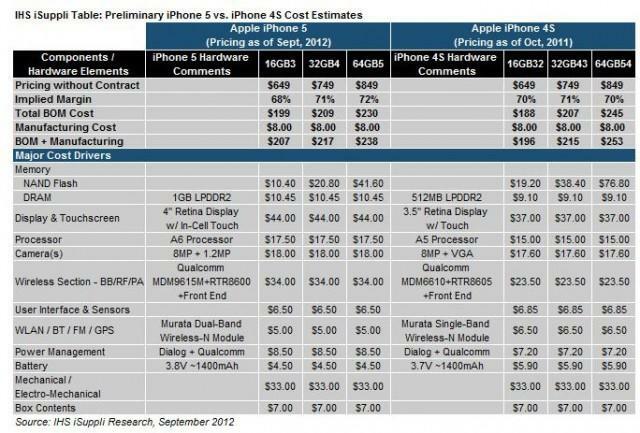 The 16GB iPhone 5 costs $207, the 32GB model costs Apple $217 and the 64GB model costs $238, the company said. By comparison, the 16GB iPhone 4S build of materials (BOM) plus manufacturing cost Apple $196 for the 16GB model, $215 for the 32GB model and $253 for the 64GB option back in 2011. I’ve met with IHS iSuppli in person, and I know they pay a ridiculous amount of detail trying to figure out each component cost, taking into consideration the possibility that Apple gets deals for bulk orders of parts and more. While its figures may not be dead-on (Apple won’t reveal that information), they do give a solid look into the kind of margins Apple makes off of its products. The 16GB model, off of a contract for example, costs consumers $649. So what do the individual parts cost Apple? 16GB of NAND Flash sets Apple back $10.40, 32GB costs Apple $20.80 and 64GB costs the company $41.60. The DRAM is steady at $10.45 for each phone, the touchscreen costs $44, the processor is $17.50, the camera costs $18, the QWualcomm MDM9615M chip sets Apple back $34, the user interface and sensors cost $6.50, the WLAN/BT/FM/GPS chip costs $5, the power management components were estimated to cost $8.50 and the battery is just $4.50. The box contents cost Apple just $7.00 and the mechanical/electro-mechnical components cost $33. So what can we discern from that data? Basically, Apple’s costs for each phone model only increase when it comes to the NAND flash storage. Otherwise all of the other components, as we already know, are the same between each model. In other words, Apple’s implied margin increases from 68% for the 16GB model to 72% for the 64GB iPhone 5. “iPhone 4S suppliers making a return engagement with the iPhone 5 include Samsung, Qualcomm, Murata, Dialog, Texas Instruments, STMicroelectronics, Cirrus Logic, Avago, Skyworks, NXP and AKM. Nevertheless—from the advanced, $17.50 A6 processor manufactured by Samsung, down to the relatively simple $0.62 electronic compass from AKM Semiconductor—almost every part has been updated,” the company said. Addendum: Please note that these costs don’t factor in things such as labor, research & development, shipping costs, tooling of molds and numerous other minor costs.